Hole In One International Insures a Shot at Glory! Phoenix, AZ – Have you ever wondered what it would be like to hit a shot on the famed par-3, 16th hole at the TPC Scottsdale during the Waste Management Phoenix Open? Two lucky golf fans (one of whom is pictured to the left), along with a host of local media personalities, Hollywood celebrities, community heroes and tournament sponsors got the chance to do exactly that a few weeks ago as they teed-it-up for charity in a unique closest-to-the-pin contest known as the “Shot at Glory”, which took place immediately following the FBR/Xerox Silver Pro-Am prior to the Waste Management Phoenix Open. Tournament hosts, The Thunderbirds, award more than $100,000 to the celebrities’ chosen charities during this unique event. And, if any participant was lucky enough to make a hole-in-one, Hole In One International was there to pay $1,000,000 to the charity of the acemaker’s choice, thanks to Mark Hester of Hester, Heitel & Associates, Inc., who has turned to Hole In One International to insure this very special golf event for the past few years. While no one aced Number 16 this year, musician Alice Cooper (pictured to right) won the “Shot at Glory”, picking up $40,000 for the Solid Rock Foundation. Brett Frazier from Waste Management, whose charity was Keep America Beautiful, came second, while former Phoenix police officer Jason Schechterle, whose charity is the 100 Club, came in third. Ready to make your next fundraising golf tournament even more successful? Request a no-obligation quote today. 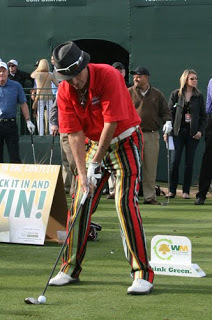 Home » Blog » Hole In One International Insures a Shot at Glory!